One of the easiest ways to make money online is by using “pre-created” content, in the form of either resale rights, master resale rights or private label rights. But let’s make one thing clear; not all resale rights products are created equal. You want to be careful with the type of products you promote, after all, they become part of your brand, and with as many different RR products available, you have the opportunity to be very selective with the products you choose. RR is considered “basic” rights, typically providing you the option of selling the product but unable to modify the content or resell the license to others. For example, you can sell the ebook but not the RR rights to your buyers. Furthermore, RR often comes with restricted rights including price limitations where you are required to sell the product for a minimum price. With Master Resale Rights, you typically can not only sell the product itself but pass on the same rights that you were given (the ability to resell the product itself). You may also be permitted to make changes to the product and set your own pricing. With most PLR licenses, you can modify the content, claim authorship, and set your own pricing, but PLR sometimes offers extended options, including breaking up the content or material, reselling the licenses to others and creating compilations from multiple PLR products. You want the product to be of top quality, complete and comprehensive. It’s important to choose only high quality products to ensure minimal refund requests, and to be able to build a reputation as a quality content provider. You also want to pay attention to the level of product distribution, as the fewer licenses sold, the easier it will be to promote – as fewer people would have seen the product elsewhere. And finally, you want to purchase products that offer you flexibility in terms of what you can actually do with the product, including adding your own name to the release, customizing it, modifying it, and re-selling it. Each RR product will carry different licensing rights, so it’s important that you carefully read the terms so that you are familiar with your rights and stay within the developer’s guidelines. 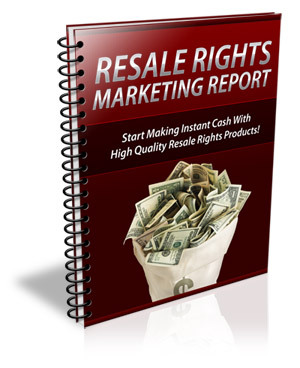 In this report, you’ll discover the top methods of monetizing resale rights products, so that you can quickly generate a full time income from quality releases.